Back in December last year I wrote about a pending experiment at work. Half of our scrum team already worked from home, and we wanted to see if things worked better or worse for us if the other half all worked from home too. After convincing our management to let us try this we targeted starting this in the first quarter of 2011. We planned to try this one sprint at a time, considering at each retrospective if it was worth continuing and what changes we might need to make to make the next sprint better. As things transpired, we found ourselves keeping this going for the entire first quarter of 2011, and we’re continuing to do it still. As might have deduced, we though it worked our pretty good for us. 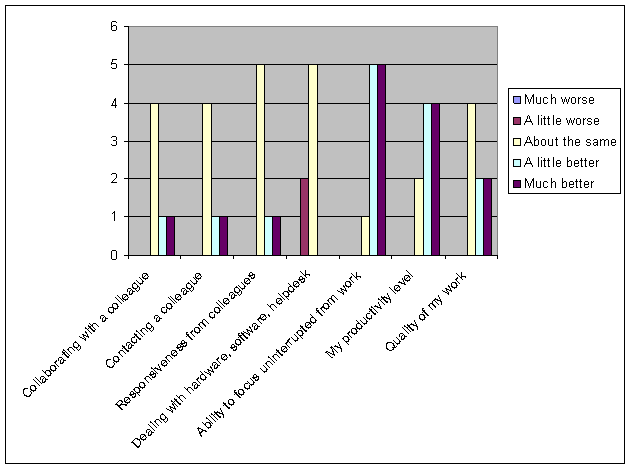 At the end of the quarter, I conducted a couple of surveys; one for the team members and one for people outside the team that we interact with. In this post I’m going to share a few of the insights from our experiment and what the surveys revealed. How was it for the team? Let’s start with a quick recap of the team composition. There are four people already working from home around the Denver, CO area – three software engineers plus me as scrum master. Then we have three people in Billerica, MA – our product owner and two testers. Finally we had (yes had, but have no more – they moved onto another team during the quarter) two further testers in Hyderabad, India. As you can see, we mostly felt that the meetings were no worse off than when half the team was office based, and in fact a few people felt they ran better. That they would run better was certainly our hypothesis going into this, based on the idea that communication would suddenly be equitable for everyone. That is to say we would now all be on a phone and there’d be no more side conversations, people failing to talk “to” the phone etc. 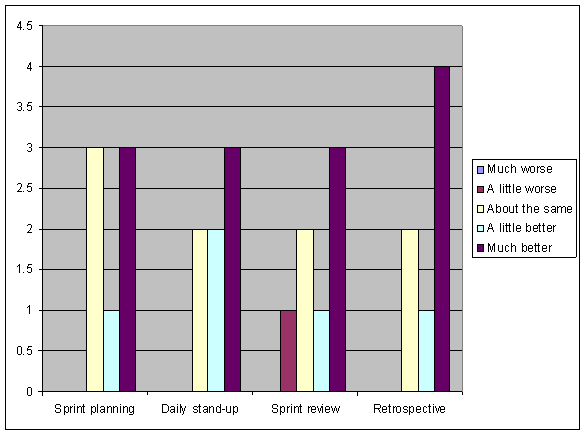 The one interesting point that shows up in the chart and is fairly intuitive too is that the sprint review meeting wasn’t universally considered better in a fully decentralized set up. 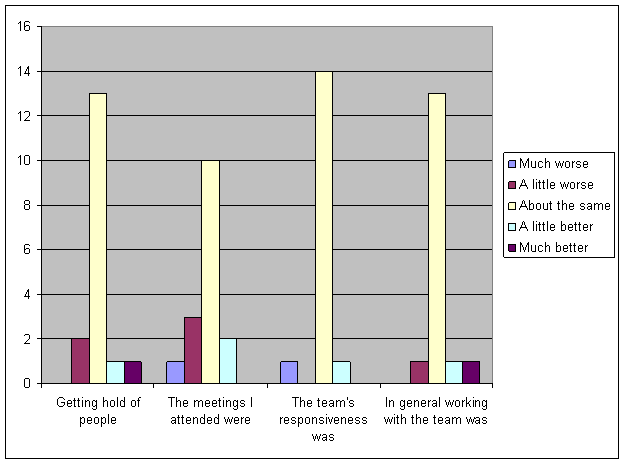 I was actually surprised more people didn’t feel it was suboptimal, and certainly if you skip ahead to the chart where we asked people outside the team how they found things you’ll notice a few people indicated that they didn’t feel meetings were always better. I don’t know for sure, but I suspect the review more than anything might have been the meeting that triggered that feeling as the others seemed to work well. I think there are two important messages. Firstly, those who think you need to be in the office to get work done forget about how much the distractions and interruptions of cube-ville can be detrimental to work. Secondly, you need to be of the “self-serve” type and/or have a good helpdesk that can work with home based users to get through those times when you need help with hardware and software issues. "Very good experiment, worth continuing, I can always come to office as needed." "Meetings are more efficient: less side conversations and greater team participation." "Work life balance was much better in this case." The final question I asked of the team was whether they would like to carry on with this. Not surprisingly the answer was mostly yes. Those already working from home felt probably felt less excited about it all – they don’t have a choice, they’re working from home whether they like it or not. How was it for everybody else? We’re not dealing with a huge number of respondents here, but still you can see that the majority of people would be interested in some kind of arrangement involving working from home, even if it wasn’t all the time. Of course the main purpose of surveying folks we work with outside our team was find out if things worked well from their perspective. After all, it’d be no good if our team was thrilled with this but everyone else we interacted with thought it royally sucked. You can’t please all of the people of the time. As you can see, for three out of the four questions we had a few folks that felt things weren’t an improvement. 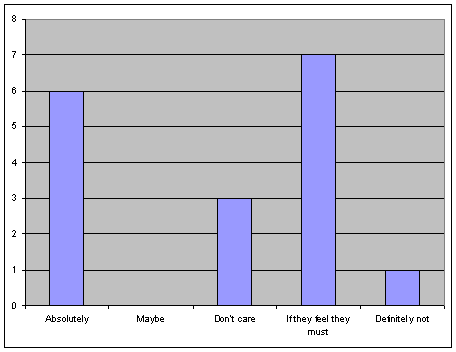 But as evidenced by the tall yellow bars, for most people it was just fine. This doesn’t totally surprise me…if you look at the communication behavior in an office, people don’t have to be very far away from each other before they resort to IM or email. Put another way, although it can be useful to be able to go and talk to someone face to face, often that is not what people do even when they are in the same office. Yesterday I read an article from Fortune magazine about a survey conducted by technology career site Dice.com. What the Dice survey clearly showed is that there is a lot of talent in the technology field that would happily work from home. From our small sample above this seems to be borne out for my organization too. However, Dice notes that fewer than 1% of the jobs offered on their site offer telecommuting as an option to candidates. The article went on to point out that, given the competitive marketplace for talent, one way employers could stand out would be to consider offering people the option to telecommute. The problem I think is that so many managers are scared of this option, seeming to believe that people need to be kept in an office so they can be checked up on, managed and so forth. Of course one could argue against this (I leave that as a trivially simple exercise for the enlightened reader) but the fact remains: many people still think this way. Convincing those that do that managing by outcomes rather than direct observation and the occasional beating pep talk is not only possible but preferable, may just be too hard. This attitude may also help explain one question which I found the responses to puzzling. 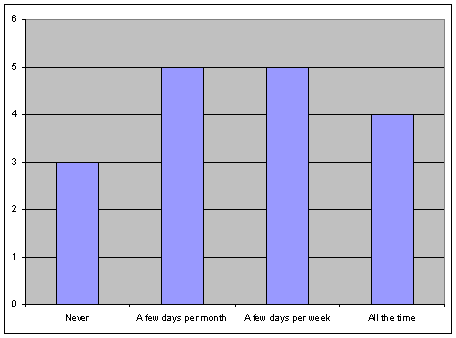 Consider the below, which shows the answers given to the question, "Should our team continue working from home?" I was surprised by how many people answered "If they feel they must." That seems at odds with the number of people that expressed an interest in working from home themselves, but perhaps, subconsciously, people still worry about the true feasibility of it. What I can tell you, as someone who's worked from home for over three years, and now have done so with a complete team all at home, is that it can work quite OK. Is it as good as all being in an office together? Probably not. But then many teams don't have the option of all being in the same office anyway. And there's a number of potential benefits to having a team distributed like this: attracting the right talent, providing people an appealing and innovative benefit, a good work/life balance and reduced facilities costs to name just a few.